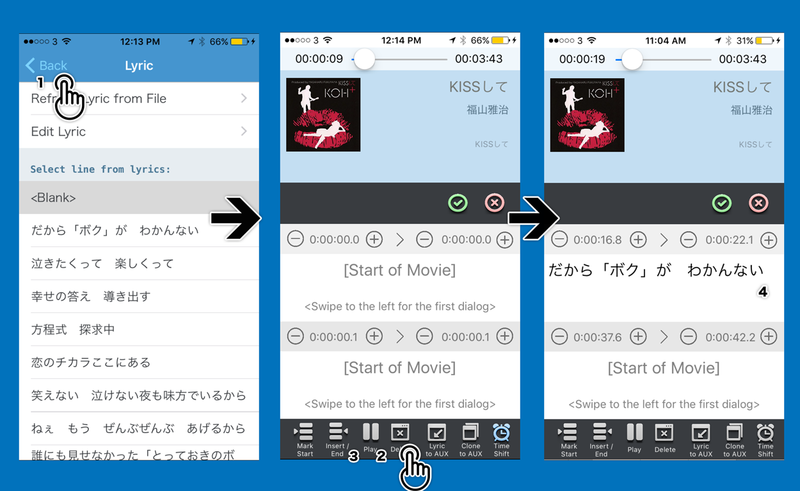 SABU has a built-in feature to edit timing of subtitles so that the dual subtitles and movies could be in sync. 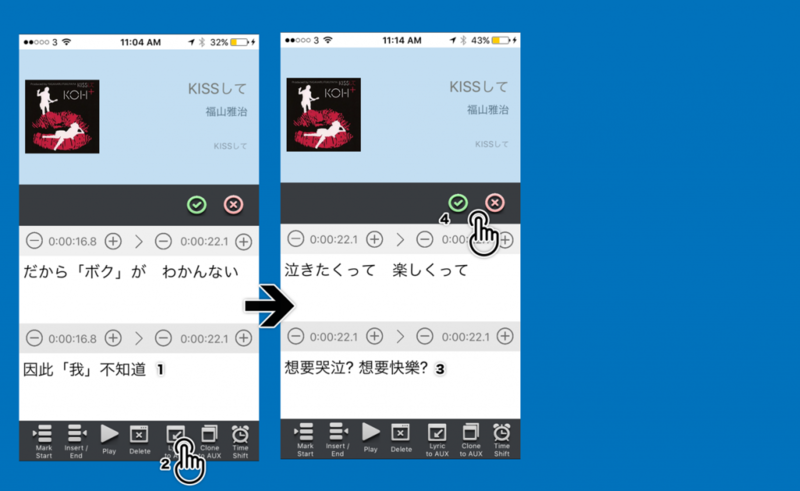 Now, SABU also incorporates the full capability to make dual and synchronized subtitles for your music. To do first, first load your mp3 into SABU and find the text of the lyrics from web. 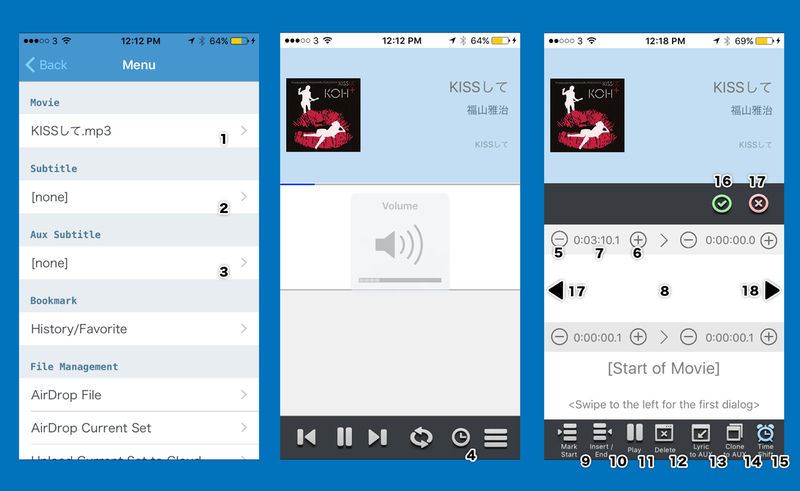 First load the song in SABU and make sure “[none]” is selected in the subtitles as shown in (1)-(3). 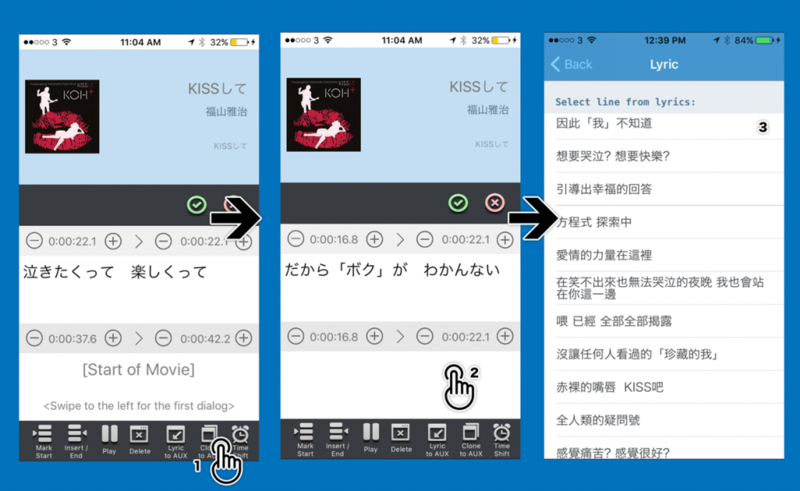 The subtitles filename generated would be based on the mp3 filename and the language you selected main and aux languages. (8) display the current lyric. (10) mark the end time of the main subtitle. move to the next line and fill in the next line of lyric from the lyric buffer. (15) enable/disable time shift mode. when this mode is on, moving the start time of the lyric would move all subsequent lines by the same time. this is useful when you need to cut the advertisement and align the start time of the song. Press (2) to edit the lyric. If the mp3 has the lyric inside, you can press (3) to retrieve lyric from the file directly. (NEW) Paste All Lines Below – paste all lyric lines in the buffer to the current and subsequent subtitle lines. The lyric page (4) is blank initially. 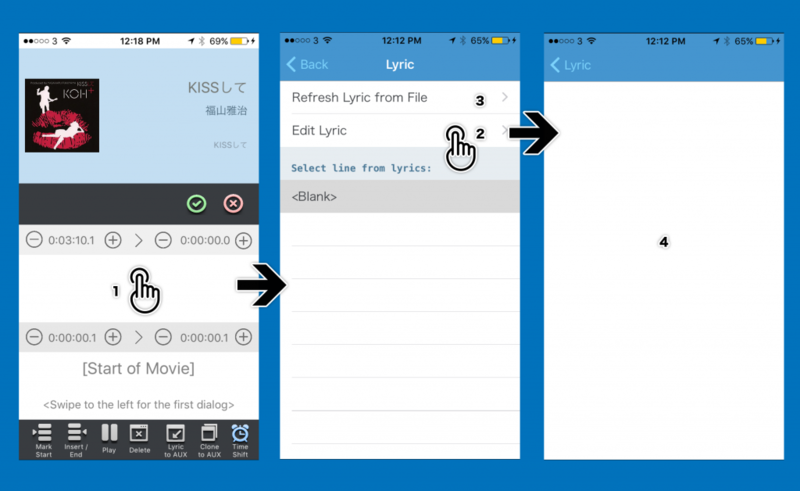 (NEW) Paste – replace the lyric buffer with the clipboard content. Now, switch to safari or other App with the lyric text. The result is shown in (3). Each non-blank line would correspond to a dialogue subtitle. You can edit, split or merge lines. Now the lyric buffer is filled with the lyric text. When the first line of lyric is heard, click (3) to insert a new line and mark the end of the current line. When the song finish, you should have the main subtitle made with synchronised lyric. Sometimes, there is a big time gap between lyric lines. You do not want to mark the start time of the line as the end time of the previous one. In this case, when the music gap finish and the next line actually begins, press “Mark Start” to remark the start time of the next line. Sometimes, the lyric is repeated and the next lyric line is not the one your want. Just press the text to bring up the Edit Lyric page. Select the correct line from the lyric buffer. It also updates the next lyric line to be used. Now, the main subtitle ( Japanese ) is made. 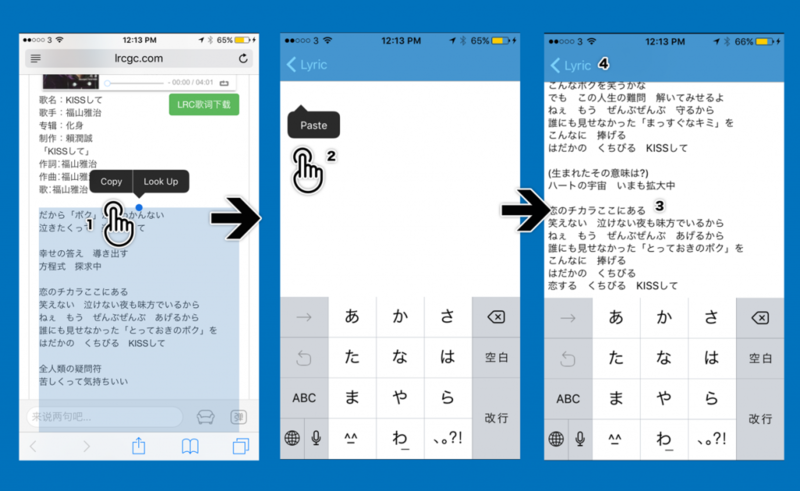 Click (1) to clone the timing from main subtitle to aux (English/Chinese) subtitle. Since you have all the timing for the aux subtitle, you just need to fill in the text. Select the line to update the current aux lyric line (1). Press (2) to copy the next lyric line in to the aux subtitle (3). Keep pressing (2) until you finish. Press (4) to save the subtitle files. The new subtitles files are named with the mp3 filename and appended the main/aux language you selected.